Koozies. They keep your hand from getting cold and your beer from getting warm—what could be better? One that keeps your beer cold for much, much longer, that's what. It's Friday afternoon, you've made it through the long week, and it's time for Happy Hour, Gizmodo's weekly booze, etc column. A cocktail shaker full of innovation, science, and substances. It's not a euphemism, it's just a good idea. Koozies are everywhere. You've seen these soft-foam beer can holders given away free at baseball games, adding splashes of color to otherwise drab construction sites, and your uncle in Myrtle Beach has like 50 of them. But what separates the Yeti Cooler from all the freebie koozies out there (aside from the price) is that instead of foam and neoprene it's made of 18/8 stainless steel with double-wall vacuum insulation. 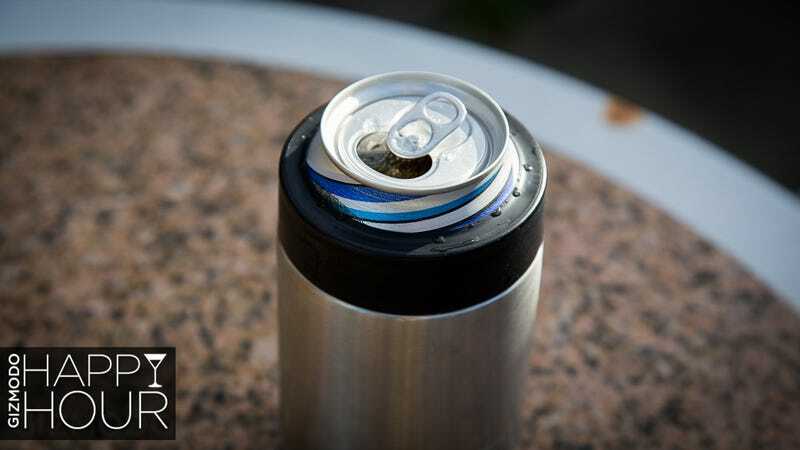 It's basically a thermos for your can of beer that will keep your brew cold for a very long time. How long exactly? I decided to find out. Yeti makes some of the best drink coolers out there, and they range from the very large—268 beers while maintaining a 2:1 ice to beer ratio—to very small. The Colster is the smallest: 1 beer, no ice. This is the one I tried. It works like this: unscrew and remove the plastic gasket at the top of the Colster. Put your cold, 12-ounce can of beer in. Replace the gasket. Drink. For the test, I stuck three cans of beer in the freezer to get them down to between 31 and 32 degrees F. Then I dragged a space heater into a small bathroom and managed to get it up in a temperature ranging from 88.6 degrees F to 101.2 degrees F. The fluctuations were caused by me entering and leaving the bathroom and by the heater cycling, but all three were exposed to the same conditions for the whole time. It was hot. Then I opened the cans and put one in the Colster, squeezed one into an old Coleman koozie my aunt had (which is probably better than your standard koozie), and left one naked to act as a control. I used an OXO instant read digital thermometer to measure all three, swirling them before each measurement to ensure the temperatures would evenly distribute. The results? The Yeti went all abominable snowman on the others. As you can see, the Yeti jumped out to an early lead and didn't look back. At the 60 minute mark, it was still just 38.5 degrees F, up from 31 degrees. Just over seven degrees during the course of an hour in a hundred-degree room is damned impressive. By comparison, the rubber koozie was at 50 degrees and the control was already up to 63.2 degrees. That's 11.5 degrees and 24.7 degrees warmer than the Yeti, respectively. And no, the Colster didn't sweat at all (though neither did the regular koozie). By the end of the two hours the results were even more dramatic. Keeping cooler meant the Colster's can retained more of its carbonation, too. For the glass bottle test, things were a bit more moderate. I grabbed three 12-ounce glass bottles of Juice Squeeze (don't ask) and submerged them in an ice bath for a couple hours. The room I was in stayed between 69.5 and 72.5 degrees fahrenheit. I then followed the same testing protocol as I did with the cans of beer. While less extreme, the results were essentially the same. The control was the clear loser here, but it was definitely a closer call between the Yeti and the koozie. The biggest disparity was at the 45 minute mark, when the Yeti was at 45.1 degrees F, the koozie was at 49.0, and the control had shot up to 56.4. Again, less extreme conditions and hence less extreme results. A four-degree difference is not one you're really going to notice while drinking a beer unless you're actively looking for it and comparing. Still, though, the Yeti was the hands-down winner. One thing I should note is that while I found that the 12-ounce cans fit in the Colster just fine, there's a lot more variation in shapes and sizes between beer bottles. Almost all of the 12-ounce bottles we tried in a liquor store were on the skinny side, which left some space between the bottle and the Yeti's walls, which would rattle and almost certainly reduce its efficiency. Also, while you can fit 16-ounce cans into the Colster, you won't be able to put the cap down on top of it, again reducing efficiency. It didn't fit much better in the regular koozie, either. Forget about a 22. This baby works as advertised. Cold cans stayed very cold, and it doesn't sweat and it doesn't chill your hand. You could also just use it as an insulated tumbler and pour whatever you wanted in there, hot or cold. The downside is, it's expensive, to the tune of 30 bucks. Sure, it out-performs a normal koozie, but your normal koozie was also probably free. Is it worth it? I mean, look, it's pretty awesome. It does exactly what it sets out to do, and it looks good while doing it. But it's reasonably hard to justify spending $30 on something that's generally gifted to you. So here, I made a really crappy flowchart to help you make your decision.